It’s below freezing and we’ve seen snow flurries here in Northern Virginia. A good time to burrow in and wish for Spring. Or at least for warmer battlefield tramping weather. I am inspired to plan some serious hikes by the news that the new Three Farms Trail is open at Antietam National Battlefield. Roulette, Newcomer (below), and Sherrick, are the three, I’d guess. This new path ties together a network of 9 trails which covers much of the battlefield terrain which saw combat 17 September 1862. So, with a goal to follow all of the trails and tramp the whole battlefield in a season, I’m wondering what would be the best way to do it? I’ll take a shot at a plan over the next few weeks … who’s with me? Our superb National Battlefield – and the development of the trails themselves – is thanks to your tax dollars and the hard work of the Park Service, along with considerable effort and funding from SHAF, the WMIA, and untold numbers of other volunteers and donors over the years. Since the interior of the battlefield is so readily accessible, it’s time to think about the Park experience beyond the limits of the perimeter driving tour we all grew up with. Rather than looking in from the outside, we can walk where they walked and see the terrain as the participants did. From some past hikes, I know this is critical to understanding the military aspects of the battle. First, though, there’s the sheer mileage. The 9 trails total just over 12 miles, over rolling ground. You could probably walk the entire system in a day, but my point will be to see as much as possible along the way in the context of the historical action. No single trail is even two miles, but each will require 3 to 4 hours to cover. I think we’re going to need at least 4 days to do the trails right. Plus time for parts of the field and sites not on a trail. Maybe 3 weekends spread out across the spring? Next is the challenge of interpreting what we’re seeing out there. The basic trail maps and Park pamphlets are good, but unlike the driving tour stops, there is little signage or historical interpretation along the way. We’re going to have to bring it with us. Otherwise, we’ll literally lose the forest for the trees. We’ll need to plan for expertise and materials in advance. There’s lots of help available, though. I expect Rangers will do at least some of the trails among their Spring tours. And there are other expert guides, narrative podcasts, and many digital and paper references we’ll be able to use to create our own packages. This trail loops to significant landmarks and monuments near the visitor center, including the historic Dunker Church and the Maryland State Monument. A good place to start after an initial orientation at the Visitor’s Center. This trail starts and ends at Auto Tour Stop 2 -The North Woods. The trail covers most of the area where the early morning action of battle took place. There were more casualties in and around the Cornfield than anywhere else on the battlefield. Throughout the morning of the battle, the Union army launched numerous attacks in and around this woodlot attempting to drive the Confederates from the field. Sedgewick’s Union division lost over 2,000 killed and wounded during one of these attacks in the West Woods. This new trail winds through the historic Mumma and Roulette Farms, following in the footsteps of Union soldiers as they advanced toward the Sunken Road where you can explore the Confederate position in what has been known since the battle as Bloody Lane. This trail connects the north end trails to the south end trails. It also takes you to some of the quietest and most beautiful areas of the park. The trail connects to the Bloody Lane Trail in the north and the Sherrick Farm Trail in the south. This trail crosses Burnside Bridge and makes a loop on the east side of Antietam Creek. The hike explores the area where the Confederates defended the Burnside Bridge, and then crosses over the creek to where the Union Ninth Corps made their advances to capture the bridge. The Snavely Ford Trail follows Antietam Creek for much of its length. The hike is mostly flat and shady except for one uphill climb at the end of the trail. Elements of the Federal Ninth Corps crossed the creek at Snavely’s on the morning of the 17th. This trail starts at the intersection of the park tour road and State Rt. 34. It meanders through farm fields and woodlots typical of Antietam. The trail ends at the famous Burnside Bridge. 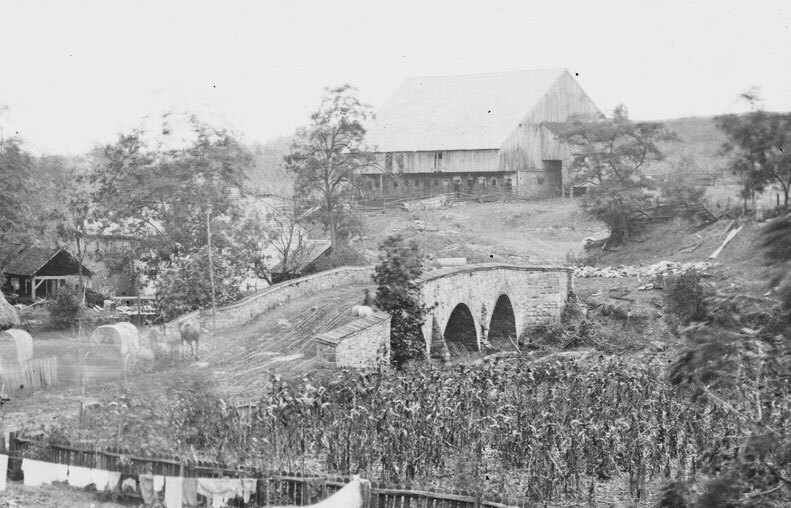 After capturing the Bridge, over 8,000 Union soldiers crossed Antietam Creek. They marched across the fields where the trail is located for the final advance to drive the Confederate Army from Maryland, only to be turned back by A.P. Hill’s final Confederate counterattack. East of the Hagerstown Pike on the northern end of the battlefield, this is private land, so touring is problematic. We’ll hope another opportunity can be arranged as was the case in March 2007. This is a critical location from which to see the perspective of Stuart’s Horse Artillery and their disproportionate impact on the outcome of the battle. A few years back I drove and walked the route from the Upper Bridge to Poffenberger’s Farm. I found it illuminating. That vicinity also takes in the later positions of the Federal Reserve Artillery which discouraged any Confederate counterattack on 18 September. I’m sad to say I’ve never been in the Pry House. Fairly recently converted to active interpretation also of medical care, it looks like a good site to get another view of the battle. Best as a (mostly) driving tour, this would cover the path of Jackson’s Command from The Ferry to Sharpsburg on 15, 16 and 17 September. In addition to the route on the Maryland side of the Potomac, let’s hope for another chance next year to also cross the river at Pack Horse Ford to the (West) Virginia side and see the site of the action there on 19 and 20 September. I’ll work on ways to bundle the trails and the other destinations into one or two day expeditions, and begin assembling background and tour materials. I’ll post them here. Meanwhile, I’d be glad to have any other ideas or suggestions from either of our readers. Late flash: Mannie Gentile has also posted today about new developments at the Park including the new trail and acquisition of the Newcomer House. It’s been another great year at Antietam National Battlefield. 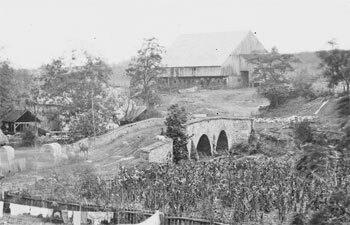 Photo of the Middle Bridge from Newcomer’s Farm, at top, from the Library of Congress: Antietam, Maryland. Bridge across the Antietam. Northeast view (September 1862). The master and individual trail maps and some of the trail descriptions are from the Park Service. Their printable trail guide (pdf) is online. Thanks to CivilWarTraveler for partnering with the Park Service to create and distribute podcasts for the trails. Steven Recker has a few podcasts of his own, and is a good guy to know if you need a Battlefield Guide. I’m in and possibly my wife depending on dates. Earlier the better (March?) as hot weather makes for unpleasant hiking. Nicodemus Heights would be a great addition. Brian, First reply seemed to get lost in the gears. I’m game. It would give me an opportunity to add more topic photos to the marker entries. Possibly even track down a few (or at least the reported location of) some of the War Dpt tablets. Nicodemus Heights would be my choice for additions. I’d like to study the ground where the CS cavalry operated a bit closer. Thanks for the trail summary and esp the links to the gudes/podcasts. And sure, I’d be interested in going. We walked the trail last week and again today. It extends off a trail we’ve walked dozens oftimes down to the ravine where Richardson’s Division formed up, but the trail goes farhter south to the the two non historic farm sites along the creek. Quite a nice walk through the woods.